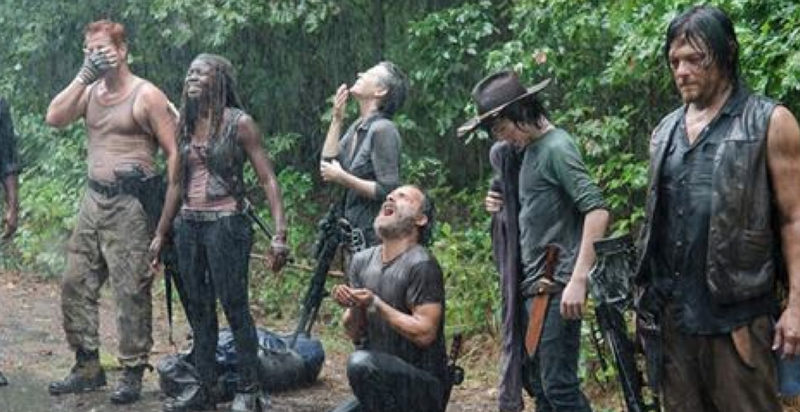 After 5 Seasons, tonight’s episode of The Walking Dead finally told us what “The Walking Dead” actually means. Sure you might have heard this before from Talking Dead or had some ideas on the meaning of the series title; but this episode gave us the powerful meaning behind this phrase as we found many of our heroes about to run out of strength. Can things get any worse or will the crew finally get a break? Find out in this week’s Closer Look. It’s been 3 weeks since our team got back from Atlanta (a day and a half or so after last Episode) and thing have just gotten worse and worse at each turn. With their last vehicle out of gas, about 60 miles to go and no more food, water or shelter, the gang is at the end of their rope. With a gathering small herd of walkers behind them, the gang doesn’t even turn to face them until they reach an advantageous spot to effortlessly toss them off a bridge. How can they possibly fight on in this world anymore? This whole episode we’ve seen how the group has kept walking forward despite everything. With many of them emotionless and the rest too deteriorated from lack of food, water or shelter from the elements, they more or less look like walkers themselves. This juxtaposition is LITERALLY made when we see the crew walking with the walkers not too far behind them. 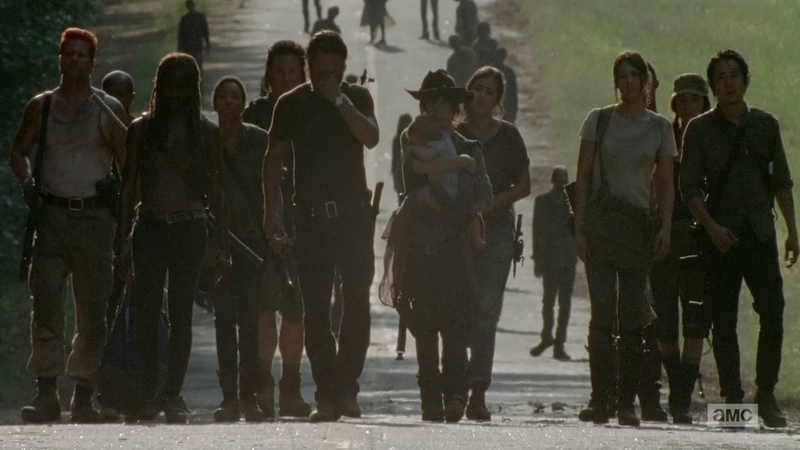 It’s hard to see where the group ends and the walkers start as they blend perfectly together. Though is this truly the group’s fate, to be ‘just like them’ [the walkers]? The episode title for this week was simply “Them”; but who does ‘them’ refer to. The way the show has progressed, it’d be entirely plausible for such a title to refer to another group. If this episode had been the title for when we met the Termites or the people of Woodbury, it’d have made perfect sense since the word ‘them’ sets up this idea of ‘The Other’. So in some ways this would be used to refer to Aaron and what his new group could mean for the group. Although as I’ll explain a little later, I think Rick and his group might find more in common with Aaron and his group then we think. So the other possible meaning of them can instead be found in Darryl’s response to Rick’s proclamation to ‘We are the Walking Dead’ – ‘We ain’t THEM’. 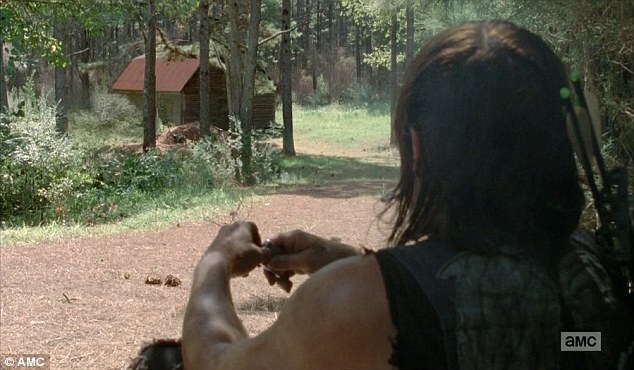 The whole episode we’ve seen the characters act more and more like walkers in terms of them becoming shambling shells of their former selves – especially Darryl. Though once Darryl proclaims that they aren’t the Walking Dead, this moment signifies an upswing in the group’s dynamic and energy level. The entire episode we’ve seen Darryl go off on his own and others push people away (Maggie to Glenn, Maggie to Gabriel, Sasha to Abraham, etc); but soon after Darryl utters these words the entire group bursts into action to help each other hold the barn doors closed against the massive herd of walkers. The group that originally wanted to save their energy and find the path of least resistance with walkers has now sprung back to life and is literally pushing back against death. Though how can the living still fight against the unending push of death? Well, that’s where faith comes in. A recurring theme in this show is how does one keep their faith in God or religion in a world like this? Well that theme was in full swing this episode as Maggie and Gabriel both experienced tests of faith. Remember that Maggie’s father Herschel was a very religious man, so much so that he kept a bunch of walkers in the barn because he thought killing them would be wrong. Maggie’s come a long way from those days and admits to Gabriel that she “used to be” religious; but that’s about the nicest thing Maggie has to say to Gabriel. As he tries to get her to open up and talk about what she’s feeling – offering her some wisdom and counsel – Maggie lashes out by pointing out Gabriel’s own hypocrisy. He was supposed to watch over his flock of churchgoers and he failed. He shied away and hid when he was needed most so how could he understand anything of what she’s going through. This is a powerful insult to be sure; but it becomes even more so as we see Gabriel start to loose faith afterwards. He knows his sins and has been trying to atone for them. Perhaps that is even why he wears all those dark clothes despite the group being near heat exhaustion. It’s his penance; and when he sees what they’ve been reduced to – eating dogs – he removes and burns his collar to symbolize his turning away from God. Though just as the group was losing the will to live and then found it again, so too are Gabriel and Maggie’s faiths restored. As the life giving rains begin to pour down, Gabriel realizes he was a fool and apologized to God for ever doubting Him. The celebrations seem short lived though as the sky turns darker and these southern residents know a Tornado might not be too far off. Things seemingly get worse as the small light of the camp fire draws in a massive herd of walkers. Though as the group is buckling under the pressure of holding back the dead, the tornado hits and just misses the barn. Maggie and Sasha walk out the next morning to discover the surrounding woods decimated, yet their rickety barn still stands strong. Much like the walker hidden in the barn that didn’t kill herself before she turned, Maggie realizes that they can’t give up just yet. They must fight till the bitter end because with a little bit of faith, they might just catch a break. The kidnapped ‘walker’ and the music box might have seemed like some pretty random moments in this episode; but if you take a closer look as these two you begin to see how they represent Beth. The music box of the beautiful little blond dancer just embodies Beth’s light and how cutesy she was. Additionally, much like Beth herself, the music box didn’t really ‘work’ in this new world until Darryl helped fix her. Because of her time with Darryl, he helped her learn how to survive, and she helped him learn how to live. It’s very fitting that Darryl returns to more of his normal self after working with the music box. As for the kidnapped walker, this is one of the disturbing walker moments in the series thus far not because she’s gruesome, but because she died when her kidnapper left her behind. To be fair, we don’t really know when she was left in the trunk so she could have turned fairly recently; but the effect on Maggie is still the same. When she realizes this blond helpless walker could have been her sister – since she originally knew Beth was kidnapped – she felt guilty that she couldn’t help put this walker out of its misery, much like how she couldn’t help Beth. This is why she had to rush back and release it from this world. So do you trust Aaron or not? He seems to have the initial charm and unassuming greeting of Gareth and the Governor; but hopefully he ends up being much better than either. The fact that the music box began playing as the scene ended could foretell that this is indeed an offering of hope and sanctuary. Then again, we’ve seen that no place is perfectly safe. Even if Aaron is a good guy and his home base is filled with good people, there’s a chance something bad will happen. Now in the comics, Aaron was the person who brought Rick and the group into the Alexandria Safe Zone; however, we must remember that things can always change between comics and tv show. Additionally, when Rick was speaking about his grandfather and said how he knew he was dead as soon as he was in enemy territory, the meaning of ‘enemy territory’ could be foreshadowing. Is this the territory of the walker, Aaron’s group, or someone else – possibly the Wolves we heard of last week. We’ll have to see what happens from here on out; but I’m willing to bet Aaron is a good guy. I mean if Rick and the gang got brought into ANOTHER fake sanctuary like Terminus, things would get a little repetitive. An important thing to note is how Darryl and Carol’s roles have completely reversed from several episodes ago. He was the one telling her ‘we’re not dead’ and trying to stop her from leaving back when they were trying to rescue Beth. Now the tables have turned and its Carol trying to get Darryl to stay with them. Contrary to a few episodes ago when Sasha told her brother that they’re not alike anymore, this episode Sasha told Michonne they were never alike. Whatever Sasha might think of the situation, they are considering at one point Tyreese also teetered between rage and in a daze. Remember when Sasha told Abraham that the drinking was going to make things worse and he responded that she’s the only thing that’s going to make things worse? Well that might have sounded like a knee jerk “I know you are but what am I” reaction; but there was actually a lot of truth to it considering Sasha “dicked” their initial walker plan over and almost got Rick bitten had darryl not shown up when he did. DANG IT EUGENE!!!!!!!! Let the record show that even in a zombie apocalypse, asking if things can get any worse will indeed make things worse. We know Darryl had a rough childhood; but seeing him burn himself with the cigarette should have reminded you of a powerful moment he had with Beth last season in “Still” when he referenced ‘cutting yourself’. In the episode it’s never made clear if he was still talking about Beth or if he had transitioned into talking about himself. Regardless, this is a powerful moment to keep in mind since Beth was the one who made him open up; and now without her he’s been pulling away. On one level, the whole idea of ‘not taking the free water’ was about the simple question of whether or not it was a trap. Though since Beth’s death still weighs so heavily on everyone, we can also look at this as ‘if they take the water, they’ll owe someone’ – the modus operandi of the Hospital in Atlanta. This is one of the very few episodes that Rick ever opens up and talks about his past. We’re so used to seeing him as the force that pushes others, it was nice seeing him open up for once. You might have missed it but when Darryl and Maggie were talking about Beth, you can hear the inflection in Darryl’s voice when he says “she was” [strong]. Again, a very subtle thing to notice, but this shows that Darryl is indeed coming out of his depression and is going to carry on with what Beth showed him. You don’t know it from his brief appearance here; but Aaron will actually be the Walking Dead’s first homosexual male character. Thank you to Omarid513 for reminding me that Tara is actually the first homosexual character – contrary to what the show runners have been saying. Next week’s episode our heroes will decide whether they trust Aaron or not as they continue to make their way towards DC. So stay tuned here, Follow Me on Facebook, and I hope you enjoyed this “Closer Look”. “…Atlanta Safe Zone.” You mean Alexandria, right? Also, technically, Tara would be the first gay character since she did tell Eugene that she likes girls. Granted, Tara’s not really all that special and maybe she’s bi, but contrary to what the showrunners have been saying, Aaron wouldn’t be the first, based on what they’ve done with Tara. And I’m sure Aaron is a straightforward guy, but that’s coming from the perspective of having read the comics.